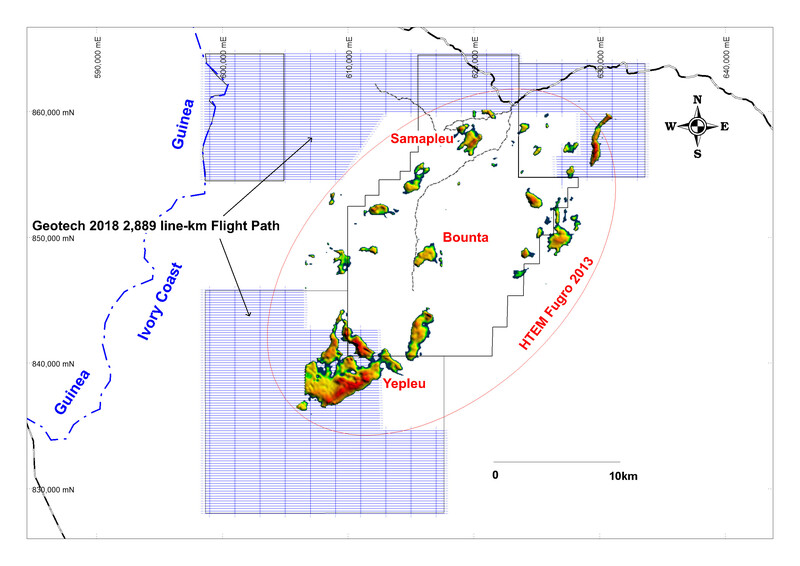 Sama launches the HPX Proprietary Typhoon EM Geophysical Survey at Yepleu following completion of Geotech HTEM survey – Sama Resources Inc.
Montreal, Quebec – May 31, 2018 – Sama Resources Inc. (“Sama” or the “Company”) (TSX-V: SME) is pleased to announce the launch of the phase 1 Typhoon™ electromagnetic (“EM”) geophysical survey at the Yepleu areas at the Company’s Côte d’Ivoire Nickel-Copper-Cobalt-Palladium Project in Côte d’Ivoire, West Africa. The Typhoon survey is planned following the positive results from the 2,889-line/kilometer airborne helicopter time domain electromagnetic and magnetic survey (“HTEM Survey”) completed in February, 2018 over the Samapleu and Yepleu areas. The HTEM Survey flew over the area at 200-meter line spacing and was carried out by Geotech Ltd., Canada, using their Versatile Time-Domain Electromagnetic (“VTEM”) geophysical system. The HTEM Survey covered sectors that were not covered by the previous HTEM survey flown by Fugro in 2013 (see link to maps below). Several newly prospective zones strongly associated with magnetic anomalies were identified from the current HTEM Survey. These new sectors add to the prospective areas already identified from the previous Fugro survey. “We are very pleased and excited with the results of the HTEM survey and the launch of the phase 1 HPX ground Typhoon survey. With this new technical information, we will be able to be more accurate in positioning drill holes to test these deeper conductors during our next drill program”, said Dr. Marc-Antoine Audet, P.Geo, President and Chief Executive Officer, Sama Resources. 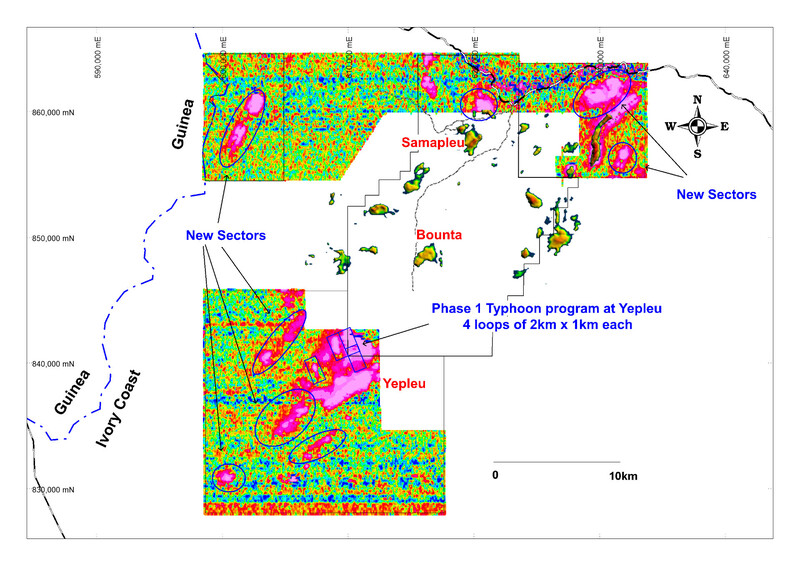 Sama has selected the Yepleu area for the phase 1 HPX’s Typhoon ground EM survey for its high quality HTEM response as well as the prospective geological setting. It is at the Yepleu area that Sama made the first discovery of nickel-copper sulphide mineralisation at surface in West Africa with material grading up to 1.39% nickel and 2.26% copper sulphide (tested using a hand held Niton XRF analyzer) (see Company’s Press Release dated June 6, 2013). The Yepleu area is located 18 kilometres southwest of the Samapleu nickel-copper Deposit. It is expected that the Typhoon technology will provide a better quality primary signal, allowing for higher resolution, larger scale and deeper detection than any existing technology. Preparation is well advanced on site for the Typhoon survey. The survey is anticipated to begin by mid-June 2018 and should last approximately 6 weeks. Compilation maps of HTEM survey are available on the Company’s website or via the following links. The Company’s exploration objective is to delineate massive sulphide reservoirs that could be the source of high-grade nickel–copper-cobalt-palladium lenses intercepted in shallower boreholes at the Samapleu deposits. The Samapleu mineralization is typical of a layered, pipe-like Intrusion or conduit‐hosted nickel deposits. These rare types of intrusions host the world’s largest nickel‐copper deposits such as: Jinchuan (515 million tonnes (“Mt”) at 1.06% nickel), Voisey’s Bay (137Mt at 1.68% nickel), Kabanga (52Mt at 2.65% nickel), Eagle (4.5Mt at 3.33% nickel), Eagle Nest (20Mt at 1.68% nickel), Kalatongke (24Mt at 0.68% nickel), and N’komati (2.8Mt at 2.08% nickel). Sama discovered the nickel-copper-cobalt-palladium mineralization when it discovered the Yacouba layered complex of mafic and ultramafic rock. This layered complex was created approximately 2.1 billion years ago by the intrusion of magma through the Man Shield. The Yacouba complex can be traced over a strike length of more than 30 kilometers within Sama’s properties in Côte d’Ivoire. Geotech’s proprietary VTEM program is the leading time-domain electromagnetic system in the world. The coincident, vertical dipole transmitter-receiver configuration provides a symmetric system response. Any asymmetry in the measured EM profile is due to the conductor dip, not the system or direction of flying. This allows for easy identification of the conductor location and for interpretation of the EM data. Geotech represents that the low noise receiver, plus the high-power transmitter yields a low noise system that has the best signal-to-noise ratio of any airborne survey system available commercially. HPX is a privately-owned, metals-focused exploration company deploying proprietary in-house geophysical technologies to rapidly evaluate buried geophysical targets. The HPX technology cluster comprises geological and geophysical systems for targeting, modelling, survey optimization, acquisition, processing and interpretation. HPX has a highly experienced board and management team led by Chief Executive Officer Robert Friedland, President Eric Finlayson, a former head of exploration at Rio Tinto, and board member Ian Cockerill, a former Chief Executive Officer of Gold Fields Ltd. For further information, please visit www.hpxploration.com. Certain of the statements made and information contained herein are “forward-looking statements” or “forward-looking information” within the meaning of Canadian securities legislation. Forward-looking statements and forward-looking information are subject to a variety of risks and uncertainties which could cause actual events or results to differ from those reflected in the forward-looking statements or forward-looking information, including, without limitation, the availability of financing for activities, risks and uncertainties relating to the interpretation of drill results and the estimation of mineral resources and reserves, the geology, grade and continuity of mineral deposits, the possibility that future exploration, development or mining results will not be consistent with the Company’s expectations, metal price fluctuations, environmental and regulatory requirements, availability of permits, escalating costs of remediation and mitigation, risk of title loss, the effects of accidents, equipment breakdowns, labour disputes or other unanticipated difficulties with or interruptions in exploration or development, the potential for delays in exploration or development activities, the inherent uncertainty of cost estimates and the potential for unexpected costs and expenses, commodity price fluctuations, currency fluctuations, expectations and beliefs of management and other risks and uncertainties.